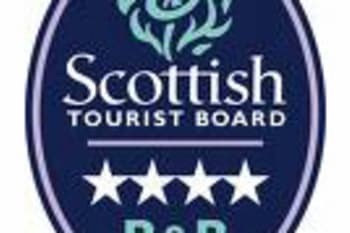 Ruisgarry is a Four Star Scottish Tourist Board graded bed and breakfast situated in the peaceful village of Breakish and has stunning views of the Red Cullin, Broadford Bay and the Islands of Pabay, Scalpay and Rona. Ruisgarry provides you with comfortable accommodation in a relaxing setting and is an excellent base for exploring the Island of Skye. The beautiful sandy beach at Ashaig is a few minutes walk from the house where you can see various forms of wildlife and stunning sunsets. All rooms are on ground floor, guests have their own lounge where they can relax looking out at the panoramic views over Broadford Bay whilst planning their route round Skye. Very welcoming host and lovely place. We love the atmosphere and breakfast there. Dorothy is so kind and helpful for our problem there. Feel free like we're visited friend's home. Ruisgarry was a topnotch bed and breakfast with a fabulous location and water views, and a lovely host that made booking and check-in quick and easy. The twin room we stayed in had its own tv with two tub chairs, although guests can also sit in the comfortable lounge to watch tv. Or just look at the view from there. We were able to choose our breakfast from a long list of choices, all of which was served in a large dining room. Would definitely recommend Ruisgarry and would stay here again. The Claymore Restaurant in Broadford was excellent. Try the fish and chips for dinner and sticky toffee pudding for dessert. Eilean Donan castle is only a short drive away (no backpacks allowed). The hosts cleaned the rooms daily, made very good breakfasts and were friendly and available when needed. We felt quite comfortable when staying there. Most car parks in Fort William have fees, although there is one at Middle Street that is free after hours. Everything was just perfect. Clean, comfortable, tasty! Great hospitality by Dorothy! A delicious local restaurant is within walking distance, so is the beach! Zeer vriendelijke gastvrouw. Prachtig uitzicht, heerlijk ontbijt. Schone kamers en lekkere warme douche. Gastvrouw zeer servicegericht (bijvoorbeeld boeken van tafel in restaurant of regelen van tickets voor ferry). Wij hebben ons hier zeer welkom gevoeld! Dorothy was friendly, helpful and welcoming. She went out of her way to book us a table at a nearby restaurant the evening we arrived. The views from the double bedrooms and sitting room are stunning. We only had one day, but very much enjoyed visiting Dunvegan castle and gardens. Because one of us was unable to to do much walking we mostly drove and stopped at view points. The Kilt Rocks viewpoint is a must. We ate at the Red Skye restaurant and the Granary (in Portree). Food and service was good (a bit pricey). The Columba 1400 leadership centre at Staffin has a good cafe with excellent views. A great place to stop. We loved the place and enjoyed our stay very much. A very welcoming hostess who was very helpful with local information. An immaculate house in a very peaceful location with lovely view of sea and mtns. Lovely breakfast and everything one required was there. Lovely welcome and the locations and views are second to none. Very comfortable beds, and the lounge is excellent to relax in. 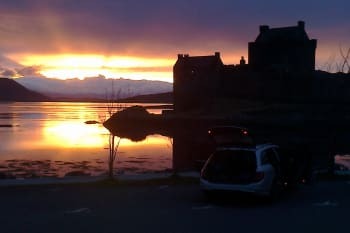 Loved the setting and fantastic views and sunsets, lovely welcome by owner and full of helpful info re restaurants in area and touring the isle of Skye. Beautiful b&b in a fabulous location.Dorothy was the perfect hostess. What more can you ask for. Hebridean hotel restaurant does decent meals at reasonable prices. The place and location is perfect, also breakfast. Thank you Dorothy! Dorothy is very friendly and welcoming. Breakfasts were excellent. Friendly welcome and excellent breakfast. Spacious and comfortable room. We had a very relaxing stay and were made very welcome by our host. Lovely facilities and gracious and polite host. I really enjoyed my stay. Very relaxing and friendly - Dorothy was very welcoming - best 3 nights sleep we have had in a long time. Great breakfast. Thoroughly recommend staying here. The Hebridean Hotel nearby serves very good food and the staff are very pleasant. The Museum of Island Life was also very interesting All in all a great few days. We had a pleasant stay in this impeccably-kept home with a view down to the coast. Breakfast was excellent. 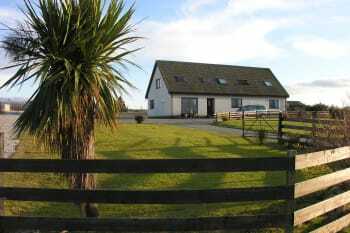 Ruisgarry B&B was excellent, with a great clean and comfortable room, a large private car park in front of the house, an ideal location to explore the Isle of Skye. Dorothy served a delicious breakfast and was an excellent hosts always friendly and helpful. We would definitely choose Ruisgarry again. Dorothy made me feel like a member of the family, the room was very attractive and comfortable, the house has breathtaking views of the sea and mountains, I'm so glad I found this spot outside the tourist crush, I was totally charmed by the beauty of the panorama, and the kindness of the hostess. Excellent hot breakfast, too! in the twin room the tv is located at top of your head so it's unusual watch it. I spent a comfortable night and had a fine breakfast. Dorothy was a welcoming host. Hebridean restaurant nearby provided good pub style food. Very friendly staff, tasty breakfast with a lot of choice, great view, located in a very calm environment, a lot of space for luggage. There is a very good restaurant close to the b&b in walking distance, located at the main road. You can see a lot of birds at the coast. 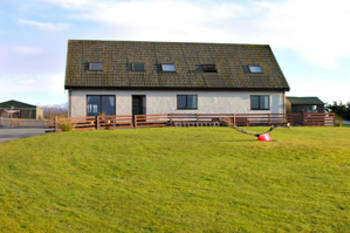 A great quiet place to stay with wonderful views and easy access to the rest of Skye. Wonderful stay - fantastic location, great rooms, fabulous host! Excellent base for exploring Skye. There was mention of sky sports on website but this didn't seem to be available. Not a big deal, just a disparity between website and property that you might want to clarify. The cooked breakfast was superb and location great for Broadford. Dorothy is a very nice and corteous host. The B&B is newly refurbished and in a very good condition. Quiet and lovely scenery around the house. 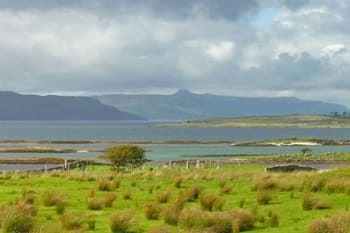 Excellent location for exploration of Skye and of the close mainland. 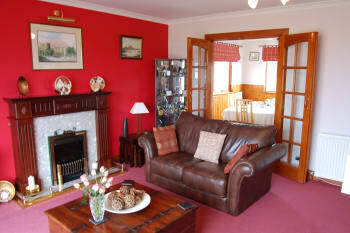 Lounge in the House with stunning views down to the bay and the impressive mountains of Skye. Nice beach in walking distance. Talisker bay is a great place and not overcrowded as some other famous sights on Skye during the main season. The welcome was lovely, the rooms top class, location.... stunningly beautiful, can't fault anything! A quiet location in Upper Breakish with a fantastic view of the ocean. This is a short drive from Broadford. We just loved the Red Skye restaurant which is within 10 minutes walking distance. Dorothy went out of her way to arrange ongoing accommodation for us during a busy holiday week. Lovely hosts, friendly and helpful.You have made your house feel like a home from home. The use of a lounge with such fabulous views was a real bonus and your breakfast choices were excellent. 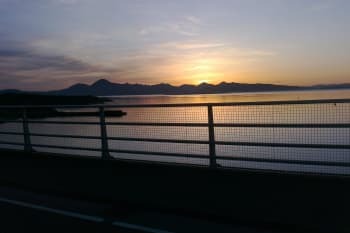 Watch the sunset from the house. It was truly spectacular. Go for a walk to local beach at low tide. 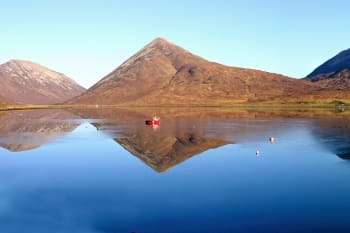 Go for meal to the Claymore Restaurant in Bradford, food superb.Do the drive to Elgol, the scenery is out of this world! This is a truly lovely bed and breakfast, easy to find, most friendly and even has a beautiful residents' lounge in which to relax. We would definitely stay here again. Very Good for who's looking for quiet and peacefull stayng. I had a lovely time - so comfortable and cosy! Dorothy made me feel very welcome. Plan plenty of time on Skye - there is so much to see that it is hard to leave! Warmly welcome. Phantastic environment. Incredible breakfast. Very recommendable! Ruisgarry is a beautiful accomodation with a stunning view. The breakfast is absolutely excellent and the hosts are very kind, helpful and friendly. You'll get a very warm welcome when you arrive. It's just perfect. You have to visit the lighthouse at Neist Point and Dunvegan Castle. If the weather is fine don't miss the Old Man of Storr. All local restaurants we tried had decent food. I'd say you can go everywhere for dinner. Enjoyed my stay, excellent breakfast. Super starting point for Skye . Extremely courteous and helpful owner . I enjoyed a delightful stay at Ruisgarry and wished I had more time to remain. The room was very comfortable, cheerful and clean. I liked the treats that there were, and the kettle. Breakfast was delicious! A lovely place to stay. The view is fabulous, the people lovely, the service super. We saw a Buzzard fly past at breakfast and a beautiful sunset in the evening before. You can hear people in the other rooms but thankfully the B&B seemed to attract quiet and considerate people. The en-suite was great to have after a long journey. We were very lucky with the weather but this attracted more midges than we expected....definitely take insect repellent as a precaution. We only stayed one night and as the cafesia restaurant was fully booked, we ate in the Broadford Hotel instead. The food was extremely good (the best fish and chips my boyfriend has ever tasted!) We came back to Skye in the following week and found the Old Man of Storr was well worth a visit (in good or bad weather - we did both), the fairy pools and of course the Cuillins must be visited (remember swim suits!) The Isle of Oronsay also made for a great day out. Fantastic views from great twin bed ground floor room. Excellent breakfast. Need a car to go to shop, places toeat and drink. A first rate B&B. Comfortable accommodation and very friendly and helpful proprietors for whom nothing was too much trouble. Tranquil and scenic location. The goats are wonderful. Proprietors are very friendly and the cheese is excellent. What a wonderful location. Superb sea view and wonderful hosts. Best regards from Germany. There is a very nice restaurant "Red Skye" right around the corner. Walking distance. Ambitious young folks doing a great job. Check it out. Make a reservation upfront. Very limited number of seats. 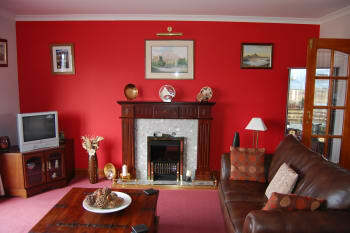 Quiet location with a beautiful view of the coastline near Broadford. Very convenient for travel through Skye. Very welcoming. Dorothy and John were very friendly hosts. It's a quiet location which is what I was looking for, but close enough to Broadford for restaurants etc. B&B is economical and best place. Everything is good. Nice place to stay close to skye bridge. The owner is friendly. The Ruisgarry B&B is a little off the beaten path. However, the views from the bedroom, lounge, and dining areas were beautiful and made our two night stay even more memorable. The Innkeeper was friendly. We were able to select from a menu what we wanted for breakfast. We would highly recommend staying at Ruisgarry B&B. We enjoy our short stay. Good reception , clean, quiet and nice décoration. Restaurants is not a real reason to go there... simple and not too bad. The living room with that gorgeous view, the incredible lovely Dorothy and the delicious fresh homemade breakfast, are only 3 facts why the decision to stay here was one of the best during the trip in scottland. Excellent. Dorothy is a very kind and helpfull hostess. The house has a good location with a marvellous view on the sea. Beds are very confortable. Room was spacious. Succulent breakfast were served . We strongly recommand to stay there. We had dinner at the Claymore suggested by Dorothy. The day after I recommand the Roselare hotel in Portree. Superbe service and nice sea foods. Thank you so much for bearing with us with our late arrival, much appreciated. Forgot to mention before leaving: the toilet flush in the double room requires a bit of persuasion. It's working, but the lever needs to be operated very vigorously. We went to Neist and Elgol for rock climbing on the sea cliffs which was very good. 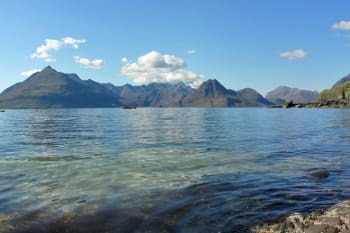 Elgol in particular is also good for a coastal walk (a little boggy in places). We were very pleased with our accommodation here! The owner was very friendly (wonderful breakfast) and very helpful referring us to local resturants based on our preferences and budget. The scenery was lovely as was our bedroom and general sitting room. An excellent base while we explored this area before moving on a bit north to continue our exploration of Skye! Would most definitely return! Es dificil llegar, pero nos mandaron muy bien todas las indicaciones y no tuvimos problemas. Muy amables. Our host, Dorothy, treated us as if we were long lost nieces. Brought us ice, made restaurant bookings, cooked us splendid breakfast. The location is lovely and the rooms comfortable. I'd go back in a heartbeat . Muy bonito y con unas vistas estupendas.Muy agradables y atentos. Todo estupendo. Perfect place - great breakfast (kippers are must try). Very Suitable location for the Elgol Boat trip and suitable for trips to Dunvegan Castle, Fair Pools, Talisker, and Old Man Storr. Perfect scenery - marvellous sunset view from the window! Very neat place and will totally recommend. Great view over the Sea! Friendly welcome and relaxed atmosphere. Lovely place to stay with a beautiful view of the sea included. Stunning scenery to view all around Skye. For history there are castles, museums and other sites to visit. Skye has a thriving arts community too. An excellent seafood restaurant in Portree in the Rosedale hotle! Print own maps and identify major points of interest before leaving home as Tourist Information Offices sadly lacking. It is a bit difficult to find this place because it is kind of middle of the field. But the view is really great. A little difficult to find but well worth searching for. Friendly and attentive hostess. Lovely view from room and sitting room. Good breakfast with nice range of choices. Dorothy gives great tips on walks and where to eat. Lovely stay! Dorothy was very friendly and helpful! Gorgeous location with a view of the water and what a sunset! Short walk to the water as well. One thing I recommend for Dorothy is to have Isle of Skye products in the bathroom and even locally made treats. Promote the lovely products that come from your island! We enjoyed our meal at the Red Skye! friendly, nice breakfast, comfortable lounge and lovely views. Claymore, excellent food. Fairy Pools a good walk. Elgol well worth a visit. Very friendly comfortable with good breakfast which you choose from a list the night before. (i.e. not a buffet arrangement) Loads of room to park and the front overlooks the sea a short distance away. Very clean. People have said in other review that it is difficult to find this location. I drove from the south coast of England and went straight there - so get out your Google map and road atlas and see how simple it is. Remember Sat Nav users live in a dream world! The single room doesn't have the sea view. If you go up to Portree drop in the Heritage centre (the AROS CENTRE just as you get to Portree on the left), for great food, friendly service, concerts and very good gift shop. Try the single track roads for a bit of adventure and a drive around the top coast past Uig for views of The Hebrides. Look out for whales in the lochs. A bit difficult to find. Please improve the road signs. Very nice and clean place with splendid view; super friendly host and great food. We loved it! Excellant view from the house. Very cozy n clean rooms! Homely atmosphere! Warm host, mrs. Dorothy! Made an excellant vegetarian breakfast! A must stay for anyone looking to stay at off beat locations!!! We thoroughly enjoyed our stay, the only negative is finding the B&B. I would suggest including a "how to find" map on website and/or any information emailed to guests. A home from home. Friendly welcome, lovely breakfast and very comfortable surroundings. Couldn't have been better. הבית ממוקם סמוך לגשר המעבר לאיסקאי כך שהמיקום שלו מאד נוח. היחס של המארחת חם והיא נותנת תחושה טובהושמחה לסייע. הנוף מהחדר מקסים. אנחנו שהינו שם יומיים. Extraordinary view on sea and islands. Very friendly host. Follow signs "Lower Breakish" though it is Upper Breakish. Nice pub "Claymore" with good food in Broadford. B&B very nice, Dorothy (the owner) is very kind. The location is very beatiful and is perfect place to stay if you going to visit Skye. It's a little bit dificult to locate the B&B. Everything was just super. Friendly, nice room, good breakfast....perfect! I would recommend the restaurant I used if only I could remember it's name - the nearest I think. Cordial and hospitable hostess. Beautiful views and close to the Skye Bridge. Nice breakfasts. Very accommodating! Warm welcoming, nice view to the sea, room very confortable and good scottish breakfast. the best localisation for departure to visit around the Island of Skye, a good restaurant at 1/2 mile : the Red Sky. It would be a good idea to have a time range for breakfast. Excellent in every way,from location to service and food. Plenty of local choice for eating, in every price range. Friendly, comfortable, beautiful location with stunning views. Great stay. Very hospitable couple who made us most welcome. . There are lots of nice eating places in the area. We did not have time to visit Elgol on this occasion but it is well worth a visit. Great location,wonderful scenery and a brilliant bed and breakfast. It was lovely to have a separate lounge area where we could all sit together. The restaurants were really good, and the area for travelling around Skye was great. The location was close enough for shops etc but also great for location. Nice B&B, with wonderful views - we were well looked after. Pleasant place, people and stay. It was a little difficult to find at first. The pub for supper was not bad but the local restaurant was very good. Thank you. What a lovely location ! The hosts are so friendly and kind, the breakfasts are excellent. The Red Skye restaurant is within walking distance and the cuisine is fantastic. We would definitely want to stay there again. The Red Skye and The Clsymore restaurants are very fine. You should remember that your GPS will not identify single track roads like the one our bed and breakfast was on. Very friendly and a great view. I chose this B&B because my destinations were in the southern part of the island. Please keep in mind that the Isle of Skye is large and if you want to see as much as possible in a few days you should consider a more central location because it takes over an hour to travel from the northern to the southern part. If you want to walk in the Cuilins this is the roght place. The B&B itself is highly recommended, with a very helpful and friendly landlady and everything you expect from this kind of accomodation. friendly people, clean and confortable room,a wonderful experience of staying. B&B situato in luogo suggestivo ed inusuale, stanza molto graziosa e molto pulita, colazione scozzese nella media, proprietaria estremamente gentile. A cosy place with a beautiful view! The bedroom was in front of the sea and with lot of space. The breakfast was really nice and with other guests exchanges. Thank you for a very pleasant stay. Lovely view from the room. It's about an hour nearer the mainland than Portree. Very handy! We had such a lovely stay at Ruisgarry! Excellent service, food and facilities! Very clean too. Incredibly friendly, very comfortable setting, clean, and a great breakfast each day! Lots if great walks and hill climbs, beautiful vistas, good food for dinner just around the corner (for a good price too), and all the people we met were very friendly. Just a great place all around! The postal code in GPS system may not direct you to the correct place but the owner of that house is kind enough to direct you accordingly. The scenery from this accommodation is excellent. Sunset is so beautiful. We had a really enjoyable stay for three nights at this lovely comfortable bed and breakfast and the welcome from Dorothy was second to none. The breakfast was the tastiest that we had during this holiday when we stayed at various places in different parts of Scotland and the location of the B & B was excellent for travelling around Skye. There is a really nice restaurant very close by which was recommended by Dorothy the owner of the B & B.
Dorothy was very friendly and happy to help. Taste of India just off the Skye bridge is very nice as is the Red Skye which is really close to the Ruisgarry - you probably need to book in high season as it is quite small.